Alderman Joe Moreno has occupied the 1st Ward seat since 2011. Two candidates: Daniel La Spata and Justin Tucker (a write-in candidate) ran against Moreno. Both main candidates faced small controversy in the news. The result: Moreno lost his seat to the new Alderman, Daniel La Spata. Now, it’s up to the residents of the West Town area to determine the political climate and how it will affect future projects such as real estate decisions. building rendering of new western avenue west town real estate by 606 trail with residential spaces. Construction season is about to begin. Two shiny new housing developments will be strategically placed near public transportation and the 606 trail at the 1700 block of N Western Avenue. The site formerly held a two story building and will now hold 49 parking spaces with 131 residential spaces total. Further development in the area has shown an amazing rise in property values. Now is a great time to buy real estate in the West Town area including Bucktown and Logan Square. The projects will include 16 affordable rate units according to a new focus on the Affordable Requirements Ordinance near Milwaukee Avenue. Machine in Wicker Park offers up new American style plates and of course lovely cocktails. Visit the West Town space at 1846 W Division St during lunch, brunch, or dinner. You may have been to the owners’ other hot spot: Headquarter Beercade in River North. No video games here, but definitely worth checking out the drinks that come with hammers - yes literal hammers (to break up glass like garnishes not for drunkenly hitting your buddies). Food items include upscale burgers, osso buco, and shrimp and grits. And if that wasn’t enough, there’s also a flower shop by the front bar. Looking for something different than small plate American food with a twist? Try Cebu, a new Filipino food restaurant in Wicker Park. The space is located at 2211 W. North Ave. in the heart of West Town. Filipino food draws influence from Spanish, Chinese, Southeast Asian, and island food. Cebu is a family business with a brother, brother, and sister team as management, head chef and pastry chef. Expect sweet and sour flavors. Lots of pork dishes, vinegar based flavors, ube (purple yam), and classic Filipino favorites with a lean toward Spanish and Chinese profiles. You won’t be disappointed when you try the tasty take on classic Korean dishes at Jeong in West Town. Korean food has a reputation of being plated ugly or not as pretty as other types of cuisines. The chefs are taking an approach to elevate Korean and put their stamp on it. Located at 1460 W. Chicago Ave, formerly Green Zebra. Investors include those behind Oriole and Kumiko in the West Loop. Expect both tasting menus and a la carte items. Get ready for a new wine bar in West Town located at 813 W. Fulton Market. 250 bottles will be available to choose from by the glass or bottle or even take a bottle home. The interior resembles a classic brick cellar with personalized recommendations. The Chicago Tribune came out with a comprehensive list of the best burgers in Chicago. The writer tried 71 burgers and compiled a list of the top 25. Here’s 5 in West Town burgers that made the cut. It’s official. Lincoln Yards - the Sterling Bay real estate development has been approved by a city council vote of 33-115. The decision came after 8 months of debates, push back, and protests. The city’s skyline will become larger as the $6 billion project will expand residential and commercial development along the North Branch of the Chicago River. Many will see West Town, downtown, and more surrounding real estate values rise. There will be residential properties, offices, shops, and recreational use of the river within the Lincoln Yards development. The project is supposed to be Mayor Rahm Emanuel’s legacy project as Millennium Park was Mayor Daley’s. The final hurdle for the Lincoln Yards project is due next month when the City Council will vote on the Cortland/Chicago River tax-increment financing district (TIF), which would be used to finance infrastructure improvements for the Lincoln Yards neighborhood. 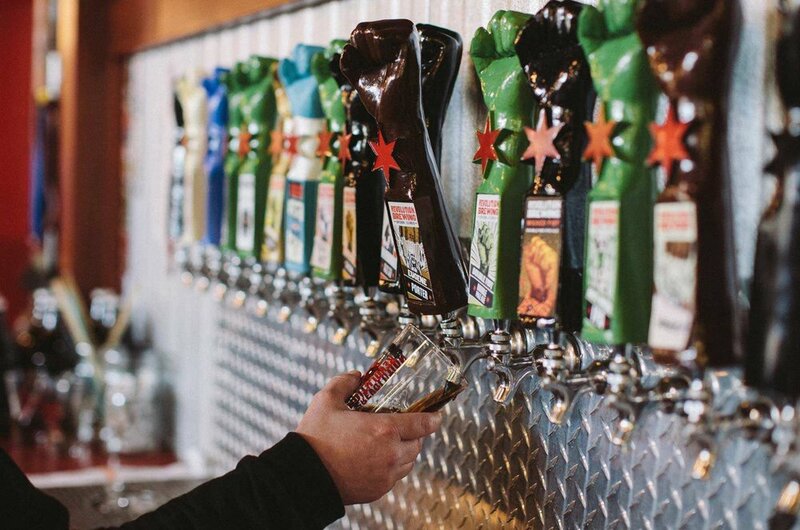 5) Revolution Brewery in Logan Square Grows Among Largest Breweries In U.S.
Revolution Brewing and Three Floyds Brewing have grown to the 38th and 48th largest breweries in the U.S. due to increasing production in their own real estate facilities. West Town is proud to host such a high quality beer. That means 85,403 barrels came out of Revolution in West Town and its facilities last year. Is It Time to Buy a Home or Sell Your Home?